Born in Derbyshire, on leaving school Alan Glasby started a career spanning 35 years as an explosives engineer. In 1974 he was awarded the George Medal for bomb disposal duties and in 1991 he received the OBE for his work in the post Gulf War ammunition recovery operation. A keen and competitive sportsman, his main interest was target rifle shooting and he won two national championships, a World Championship team Gold medal and H M the Queen’s Medal for champion shot in the British Army. 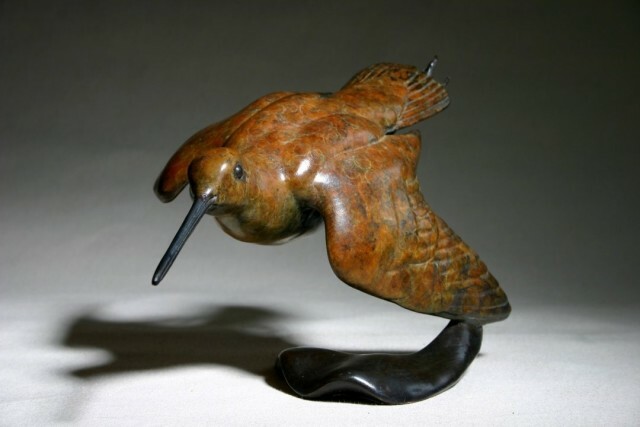 Although interested in wildlife and art from an early age, it was not until 1988 that Alan decided to ‘have a go’ at carving and sculpture after an inspiring conversation with a colleague who had taken up decoy carving. With no formal artistic training he developed his own style and methods and all his pieces are birds, which he believed should display their own individual presence and character. All of Alan’s pieces were produced in limited editions in bronze and he patinated his own work, giving it a truly unique finish. Sadly Alan died of cancer in 2008 and his son, Andrew, is very proud to be able to continue to cast his father’s work while the editions are available and to patinate them, having learned over the year’s the secret of his father’s patination. Alan’s work is widely collected throughout the country and abroad. Commissions include a life sized Goshawk that was presented to the Oman School of Aircraft control by HRH Prince Andrew, a half size Golden Eagle for the Royal Auxiliary Air Force for presentation to Her Majesty Queen Elizabeth 11 to mark 50 years as Air Commodore-in-Chief, a Snipe for the RSPB for annual presentation as an award for Wetlands Conservation and a Sandpiper for the Scottish Charity ‘The Sandpiper Trust’.